This discussion is about "iSTORYA.NET for Mobile is now available..." in the "News & Announcements" forums. iSTORYA.NET for IOS will follow in the next few days. Please post your feedback below. Thanks! Last edited by BeoR; 11-18-2013 at 01:25 AM. beyee, lodyl, gaevwa and 25 others like this. BeoR and bj88 like this. This is really good. Improving. 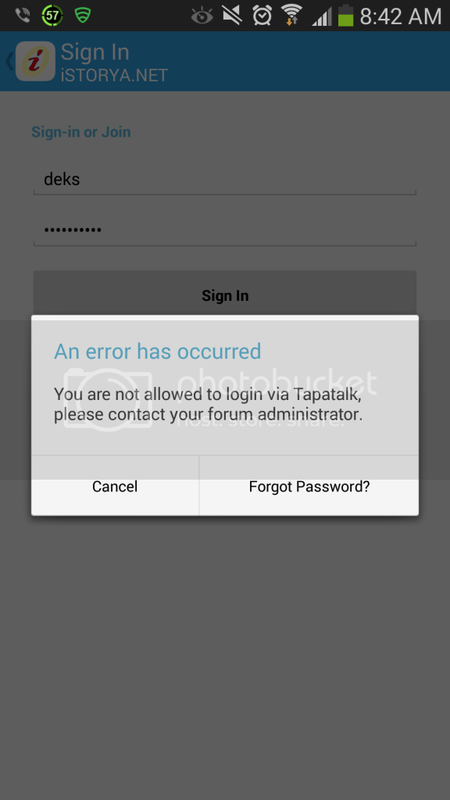 "You are not allowed to log-in via TapaTalk"
Last edited by deks; 11-18-2013 at 08:44 AM. Sorry about that guys. I forgot to remove the restriction while we were testing the app. It should be good now. ChatBox isn't supported yet even through the app's browser. We'll add a tab for it as soon as the browser gets updated. Even the home page isn't app supported yet but it gets viewed through the app's browser.